Our first harvest of red Norland potatoes being washed by our son Paul. After, what seemed a spring that would not allow us to get our garden planted, we have finally started to harvest vegetables from our garden at Amil’s Inn Bed and Breakfast. One of our earliest vegetables harvested is our red Norland potatoes which are used in many of our farmhouse breakfast entrees. We are also harvesting other produce out of the garden such as basil, parsley, tomatoes, zucchini, green beans and cucumbers and have been canning and freezing as much of the fresh produce that we can find time for. Breakfast is so wonderful this time of the year at Amil’s Inn Bed and Breakfast. This morning we served our guests Raspberry Stuffed French Toast, Crispy Bacon and Roasted Parmesan Red Potatoes over a bed of sautéed Zucchini and Onions as well as Blueberry Muffins and Watermelon Balls along with Cran-raspberry Juice and Coffee. 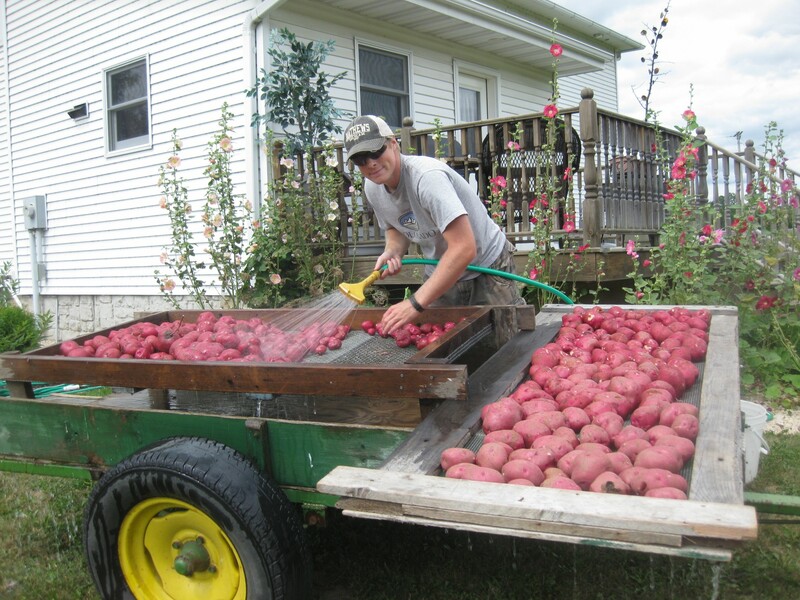 Just a few weeks our son Paul helped dig and wash the Norland red potatoes. We still have our Russet potatoes to harvest. We love these potatoes since they store very well for winter and can be used in so many recipes. One of our favorites for those cooler fall and winter days is Crock Pot Cheesy Potato Soup. We would like to share it with you. Enjoy! In a large Crock pot add potatoes, white onion, milk, cheddar cheese soup and 1 stick of butter (sliced), mix well and cover. Cook on low for 5-6 hours (until potatoes are fork tender). Stir in sour cream and shredded cheddar, recover and let cook an additional 20 minutes. Ladle soup into bowls and garnish with green onions, bacon bits and a dollop of sour cream, if you desire.